If you're passionate about pursuing a career in education, social work, community outreach, gerontology, counseling or foster care, a bachelor's in child and human development is what you'll need to launch your career. A human development degree will provide you with the knowledge and practical experience needed to understand psychology, sociology, and physical and learning development and disabilities in children and adults. The degree can be earned online in four years or less with accelerated learning opportunities. This makes it ideal for students who plan to maintain a full-time job and family life while earning the credentials necessary for career advancement. As the cost of college tuition continues to rise, many students are concerned about being overburdened with debt upon graduation; an increasing number of students are now turning to online learning for the affordability and flexibility it offers. When searching for affordable online child and human development programs, however, it's important to note the difference between schools that are simply cheap up-front, and those that offer the greatest value on the whole. 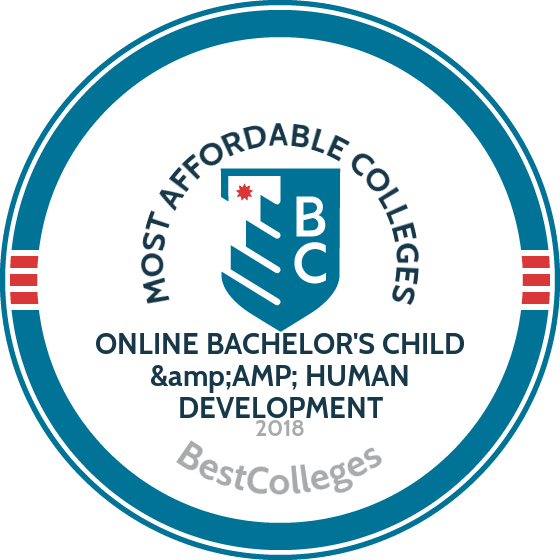 To help get you started in your search, BestColleges.com has created a ranking of the most affordable online bachelor's in child development programs using its College Affordability Score. Weighing criteria such as graduation rates, student-to-teacher ratios, and financial aid opportunities available, our list determines schools that offer not only affordability, but academic excellence. Explore our ranking of the most affordable online bachelor's in child development programs, and get started on your degree today. UW offers a bachelor's of arts in early childhood & family studies as a degree completion program. This affordable child development degree online offers two degree pathways: the core pathway and the teaching and learning pathway. The core pathway prepares students for careers in community support, policy, and advocacy, while the teaching and learning pathway prepares distance learners to become preschool teachers and directors. The curriculum include courses on a variety of topics, such as exceptional children, social policy, positive behavior support, and engaging interactions and environments. Students must also complete a senior capstone, a child observation and assessment, and a service learning and research project. Online courses are delivered asynchronously through Canvas, allowing students to complete coursework at their own pace. However, assignments will have deadlines and courses follow a weekly schedule. Applicants must have at least 70 transferrable credits earned with a minimum GPA of 2.5 to be considered. CSU offers a child development degree online that examines lifespan concepts within socio-cultural and historical contexts. Students must choose one of three concentrations: early childhood development, adult development and gerontology, or women’s development. This 80-unit bachelor's of arts in human development is offered as a degree completion program for students who have already completed two years of college coursework. The curriculum includes courses on a variety of child development topics, such as lifespan physical and cognitive development, theories of human development, girls and women across the lifespan, child language development, and a senior capstone research seminar. Online courses are delivered asynchronously, allowing students to complete coursework at their own pace. Student must complete at least 45 units in residence at CSUEB to graduate. CSU is accredited by the Western Association of Schools and Colleges. USU offers an online child development degree that prepares students for careers serving people across their lifespan and achieving fulfilling family relationships. This bachelor's in family life studies is a degree completion program and expects that students have completed some previous college coursework. The curriculum explores a variety of topics, including human development, family relationships and economics, and consumer issues. Students must also complete a specialized capstone practicum experience. Online coursework is delivered through Canvas and is offered in both seven-week or 14-week sessions. Students have access to a variety of resources, including tutoring, remote IT assistance, academic advising, testing services, and a writing center. Applicants must have a minimum GPA of 3.0 to be considered. Those under the age of 25 must also submit SAT or ACT scores. USU is accredited by the Northwest Commission on Colleges and Universities. CSU offers an online degree in child development that accepts all students, including freshmen and transfers. This bachelor's of science in human development and family sciences program consists of 120 credits, including 42 upper-division credits. Students must choose one of the following specializations: prevention and intervention sciences, early childhood professions, leadership and entrepreneurial professions, pre-health professions, and human development and family studies. There are also options to specialize in more than one concentration, minor in gerontology, or pursue early childhood director qualifications. The curriculum includes courses on a variety of topics, such as professional skills development, risk and resilience across the lifespan, adult development, general psychology, and writing arguments. Students must also complete an intensive, hands-on field experience. Courses are offered in the fall, spring, and summer terms and students typically enroll in two or three courses each semester. While transfer credits are accepted, students must complete at least 30 upper-divisions credits at CSU to graduate. CSU is accredited by the Higher Learning Commission. ASU offers an affordable child development degree online through the School of Social and Family Dynamics. This program is ideal for those who want to develop strong communication, critical thinking, and research skills and pursue careers in business, social services, counseling, medicine, or law. This 120-credit bachelor's of science in family and human development consists of 40 classes, including 45 credits of upper-division courses. The curriculum includes courses on a variety of child development topics, such as adolescence, personal growth in human relationships, parenting, human sexuality, and supervised research experience. Students can also complete an optional internship. ASU offers six online terms each year, with two eight-week session during the fall, spring, and summer semesters. Students can transfer up to 64 credits towards their degree at ASU. Applicants are encouraged to submit SAT and ACT scores with their application. ASU is accredited by the Higher Learning Commission. WSU offers a bachelor's of arts in human development that emphasizes individuals and families of various ages and demographics. This online degree in child development prepares students to work in child-care centers, preschools, senior centers, and programs such as the YMCA and Head Start. The curriculum includes classes on a variety of human development topics, such as family systems, lifespan development, child maltreatment, death and dying, parent-child relationships, families in poverty, and gerontology. Students also have the option of completing a culminating experience through either a practicum course or field placement. Online courses are delivered asynchronously through Blackboard, allowing students to complete coursework at their own pace. However, all assignments have specific due dates. Students are free to transfer credits from another accredited institution towards their degree, but they must complete at least 21 credits of coursework at WSU to graduate. WSU is accredited by the Northwest Commission on Colleges and Universities. UTPB offers an affordable bachelor's of arts in child and family studies that emphasizes using information about children and families to improves their lives and development. This online child development degree program includes an optional learning and development track which focuses on children’s physical, social, emotional, and cognitive development. The 120-credit curriculum includes courses on a variety of topics, such as exceptional child, social stratification, language development, family dysfunction and substance abuse, motor development, and women’s studies. Students must also complete a senior capstone research seminar. Online learners have access to a writing lab, tutoring, career services, and departmental advisors through the UTPB Distance Learning Program Center. Transfer credits are accepted, although students must complete at least 30 credits at UTPB to graduate. Applicants must submit SAT or ACT exam scores to be considered. UTPB is accredited by the Southern Association of Colleges and Schools Commission on Colleges. OSU offers an affordable bachelor's of science in human development and family sciences degree through the College of Public Health and Human Sciences. This program emphasizes development across various social justice contexts, including family, school, and community settings. This child development degree online program offers optional minors in subjects such as sociology, public health, or psychology. The curriculum includes courses on a variety of human development topics, such as human sexuality, adult development and aging, human nutrition, epidemiology and health data analysis, family violence and neglect, and parenting research. Online courses are delivered asynchronously through Canvas, Skype, and Google Hangouts. Asynchronous course delivery allows students to complete coursework at their own pace. Applicants who graduated high school after 2010 must submit SAT or ACT scores to be considered. The school also prefers applicants who have a minimum GPA of 3.0. OSU is accredited by the Northwest Commission on Colleges and Universities. NDSU offers an affordable child development degree online program that emphasizes the promotion of child health and protection. This bachelor's of science in human development and family sciences: child & adolescent development program includes courses on a variety of topics, such as prenatal, infant, and toddler development, couples, marriages, and families, family science, children and family across cultures, gender and aging, and youth policy. Students must also complete a five-credit internship which can be completed in their local community. Online classes are delivered through Blackboard, Moodle, and Campus Connection. Some online classes at NDSU are self-paced, while others will have specific due dates for tests and assignments. Students can complete this program in four years of full-time study. Applicants must have a minimum GPA of 2.75 and submit SAT or SAT scores to be considered. NDSU is accredited by the Higher Learning Commission. UMass Amherst offers an affordable 120-credit bachelor's of arts in children's learning and development that examines child advocacy and youth and family programming. The curriculum includes courses on a variety of child development topics, such as diversity, educational psychology, survey of children’s literacy, international education, stab stance abuse services and intervention, cognitive behavior, disorders in children, child maltreatment, and behavior management. Students must also complete a writing about experience course where they create a portfolio of essays about their learning experiences. UMassOnline coursework is delivered through Blackboard Learn and includes audio and video lectures, discussions, chat rooms, and readings. Students are not required to log in at specific times, but assignments do have specific deadlines. This program is designed for working adults and requires that applicants have previously earned at least 12 credits of college coursework to be considered. This program is currently offered to students in all U.S. states except for Alabama and Arkansas due to state restrictions. UMass Amherst is accredited by the New England Association of Schools and Colleges. WVU offers a bachelor's of science in child development and family studies program that prepares graduates to work with preschool children in a variety of settings. Students can choose one of two areas of emphasis: a non-certification child development track, or the preschool education track that meets the requirements for pre-K certification. The entire program can be completed online except for the CPR & first aid certification class and the nine-credit supervised field experience, which has students work with children up to five years old in their own communities. The 120-credit curriculum includes courses on several child development topics, such as contemporary issues, child care center administration, art of leadership, special education, and technology for young children. Distance learning students have access to a variety of resources, including enrollment coaches, academic advisors, and the university library. Applicants must have a minimum GPA of 2.5 to be considered. WVU is accredited by the Higher Learning Commission. CSP offers a bachelor's of arts in child development with a specialization in teacher education that is ideal for adult learners. The curriculum includes courses on a variety of topics, such as writing for educators, child social and emotional growth, human diversity and relations, children’s play and learning, infants and toddlers, and language development. They must also complete fieldwork in an early childhood learning center or licensed child care facility. Online courses are delivered through Blackboard in accelerated seven-week terms. CSP offers a variety of financial aid services, including scholarships and grants. In fact, all first-year students receive some form of financial aid. Transfer students can trade in previously earned credits to receive a $2,000 scholarships. Applicants must have a minimum GPA of 2.0 to be considered. CSP is accredited by the Higher Learning Commission. Pacific Oaks offers a child development degree online program that emphasizes social justice, advocacy, and respect for diversity. This bachelor's of arts in human development explores human skills and developmental milestones within children and adults. Students can choose from four concentrations: early childhood education and development, active learning across the lifespan, social change, and working with adults. The curriculum includes courses on several human development topics, such as working with bicultural children, lifecycle issues, developing anti-bias curriculum, lifespan learning and education, and social and political context. Online coursework is delivered through Canvas in accelerated seven-week sessions. This program is intended for transfer students who have a minimum of 46 credits or an associate degree in child development or early childhood education. Students must complete a minimum of 30 credits at Pacific Oaks to graduate. This program can be completed in two years of full-time study or four to five years of part-time study. Pacific Oaks is accredited by the Western Association of Schools and Colleges. UW–Stout offers an interdisciplinary online child development degree that focuses on the interrelationships between families, communities, and individuals. This bachelor's of science in human development and family studies emphasizes hands-on, experiential learning and observation through field experiences and practicums in hospitals, human service agencies, and community group homes. The curriculum includes classes on a variety of topics, such such as dynamics of family development, family interventions, critical cultural competence, abuse and the family, and a seminar on self-growth. This program is intended for students with an associate degree or equivalent and allows students to build their own 15-credit concentration. Students must also complete an internship with a minimum of 204 hours. Online coursework is delivered through Desire2Learn and Blackboard Collaborate Ultra. Students can earn their degree in two years of full-time study, although many choose to attend on a part-time basis. UW Stout is accredited by the Higher Learning Commission. SOU offers a bachelor's in early childhood development that is ideal for those interested in working with young children and their families in a variety of roles. The curriculum includes courses on a variety of topics, such as children at risk, curriculum design, advocacy and leadership, from risk to resiliency, and a capstone profile project which includes creating a portfolio. This programs requires 180 quarter credits for graduation, including 60 upper-division credits from SOU. This child development degree online program is a degree completion program, which means that students must complete early childhood prerequisite classes at another accredited college or university. Online coursework is delivered asynchronously through Moodle and ownCloud, although assignment do come with due dates for all assignments. There is also a one-credit face-to-face Saturday workshop each term. Applicants who have GEDs are not required to submit SAT or ACT scores or high school transcripts. SOU is accredited by the Northwest Commission on Colleges and Universities. EKU offers an affordable child development degree online that prepares graduates for careers as teachers or administrators in early childhood facilities. This bachelor's of science in child and family studies with a concentration in child development includes courses on a variety of topics, such as family stress and resilience, program planning for infants and toddlers, cognitive psychology, the autism spectrum, addictions, and children’s services. Students must also complete a 100-hour supervised early childhood practicum. Online classes at EKU are delivered through Blackboard and consist of video lectures, PowerPoint presentations, discussion boards, and reading assignments. EKU online courses are offered in accelerated six- or eight-week terms with most distance learners typically enrolling in two classes per term. Applicants must have either an associate degree or a minimum of 24 transferable credits and submit SAT or ACT scores to be considered. EKU is accredited by the Southern Association of Colleges and Schools Commission on Colleges. UI&U offers a bachelor's of science in child development that focuses on children from birth through adolescence. Students can choose between two tracks: child and adolescent development or early childhood studies. The child and adolescent development track is a hybrid program that blends online and classroom courses at Los Angeles or Sacramento campuses, while the early childhood studies track is offered entirely online. This program examines the cognitive, social, emotional ,and physical developments and prepares students for careers in human service and education settings. The curriculum includes courses on a variety of child development topics, such as transforming learning standards into achievement, art and science of assessing children and families, learning through play, the exceptional child, and working with young dual language learners. Online coursework is delivered through Campus Web, GoToMeeting, and Adobe Connect Pro. Distance learners have access to a variety of resources, including a writing center, academic advisers, and 24/7 student support services. UI&U is accredited by the Higher Learning Commission. UA offers a bachelor's of science in HES human development and family studies with a concentration in child development that is ideal for child development practitioners who work in Head Start agencies. This affordable child development degree online emphasizes children up to eight years old and prepares students to design and implement preschool programs. The curriculum includes courses on a variety of topics, such as children’s health and safety, families and communities, infancy and toddlerhood, child centers and programs, and development perspectives of young children disabilities. Transfer students can apply up to 60 credits towards their degree, although they must complete at least 30 credits at UA to graduate. Applicants must have a high school diploma with a minimum GPA between 2.5 and 3.0, depending on when they graduated, to be considered. UA is accredited by the Southern Association of Colleges and Schools Commission on Colleges. Penn State offers a bachelor's of science in human development and family studies that prepares students for a variety of careers in the field. This child development degree online can be earned in conjunction with various certificates in children, youth, and family services or adult development and aging services. The curriculum includes courses on several human development topics, such as human development and family studies interventions, the helping relationship, and adult development and aging. Students must also complete an advanced project and a one-semester internship in a human service organization in their communities. Penn State’s World Campus delivers online courses asynchronously, allowing students to complete coursework at their own pace. Students must earn at least 36 of the final 60 credits of their degree at Penn State to graduate. Penn State is accredited by the Middle States Commission on Higher Education. HIU offers an online degree in child development with two different concentrations: community mental health and counseling or family studies. The mental health and counseling track explores topics such as mental health interventions and abnormal psychology, while the family studies track examines the physical, cognitive, and social development of children and adolescents. This 120-credit bachelor's of science in human development includes courses on a variety of topics, such as art across cultures, adult development, christian perspectives in human development, risk and resiliency, community mental health, counseling skills, and career counseling. Online courses are delivered asynchronously, allowing students to complete coursework at their own pace. Coursework is offered using video lectures, real-time chat, and discussion forums. HIU is accredited by the Western Association of Schools and Colleges. Must offer a bachelor's degree program in criminal justice, 100% online.